Sailing yacht Jeanneau 53 named Alkioni has been produced in 2012. We propose her from base Athens in the area of Athens. Alkioni is registered for 13 persons. 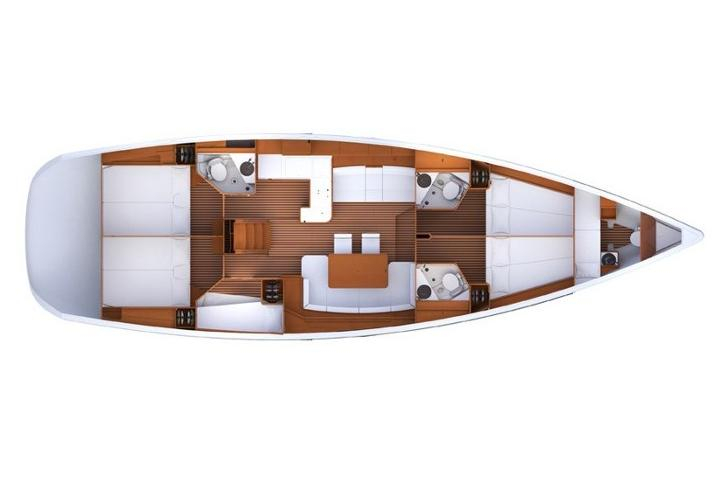 Layout of the yacht is 13 (10+2+1). Jeanneau 53 Alkioni has 6 bedrooms. For guests disposal there are 3 WC. With engine 110 Alkioni can move really fast. Alkioni is 16.06 meters long and 4.77 m wide. Draft is 1.8 meters. Find about our offer in section: Yacht charter Athens. Vessel's equipment involves : Gps, Autopilot, Gps plotter, Bimini top, Dinghy, Anchor electric windlass, Hydraulic gangway, Outboard engine, Inverter 12v-220v, generator, Radio / cd player, Bed linen, TV, Air conditioning, Dvd, Bow thruster, Furling mainsail. . Caution is 3500.00 EUR. Choose our offer and enjoy your holidays on the deck of Alkioni. This Jeanneau 53 from Athens from Greece You can find following this link: Yacht charter Greece.